Ideal for many facets of model-building. Indoor shapes are ideal for museum-quality and smaller-scale model construction where outdoor shapes have high impact characteristics that provide durability, flexibility and longevity of the model. Plastruct Styrene Structural Shapes are precision-extruded in white styrene plastic. Stairs and Stair Rails — Stair Rails are used for open stairways commonly found in industrial complexes, high-rise fire stairs, parking structures, tanks, platforms, and other unfinished or open structures. 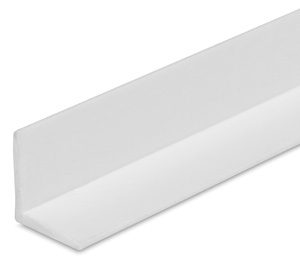 Stair Rails are used for hand rails on stairways. Angles — These angles are used for bracing in the construction of heavy steel structures and vertical support legs in light structures. Channels — These Channels are used for bracing or lightweight vertical support members in the construction of most steel structures. I Beams — These I Beams are used for horizontal or diagonal members in the construction of most steel structures. Open Web Trusses — These trusses are used for roof trusses, bridges, conveyors, space frames, and other steel structures. Ladders — Used as straight ladders commonly found in industrial, commercial, and residential applications. Note: In most industrial applications using a fixed ladder, a cage is also desirable. Tees — Used for bracing in the construction of most steel structures. Zees — Used for bracing in the construction of most steel structures. U Channels — Used for bracing or medium-weight horizontal and vertical support members in the construction of most steel structures. Hand Rails — Used for hand rails on platforms, walkways, balconies, and any other elevated structures with public access. H Columns — Used for vertical or horizontal members in the construction of most steel structures. Cages/Ladders — Used on towers, tanks, buildings, and other tall structures where a ladder is perpendicular (or 90°) to the ground. Note: In most industrial applications using a fixed ladder, a cage is also desirable.